I’ll post more about this soon, but I wanted to see if this “virtual chumby” worked on the blog. My “geek present” this year was a “Chumby” (www.chumby.com). In short it is a mini touch-screen device that you can subscribe to different “widgets” on different channels and it picks them up for you via WiFi. You can get your e-mail, current eBay auctions, weather, news, blog/rss feeds, clock, games, twitter, photos (flickr & more) and even develop your own widgets if you know a little flash (samples included). The “virtual chumby” above is actually my “info” channel with some cool subscriptions. Oddly if you watch long enough you will see this post on the virtual Chumby (need a screen shot of that). My Chumby is all black and currently called Bobo (you have to name it) and sitting on my desk at work. A goal would be to develop a widget for it at some point, but that is like #12 on my top 10 list of things I want to do. 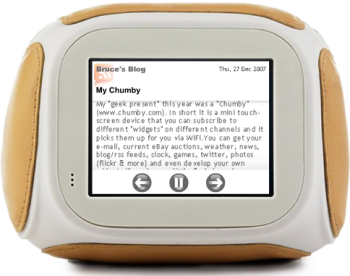 This blog post in the Chumby ….. now I just need to get this update in the Chumby ….. like that infinite mirror thingy.